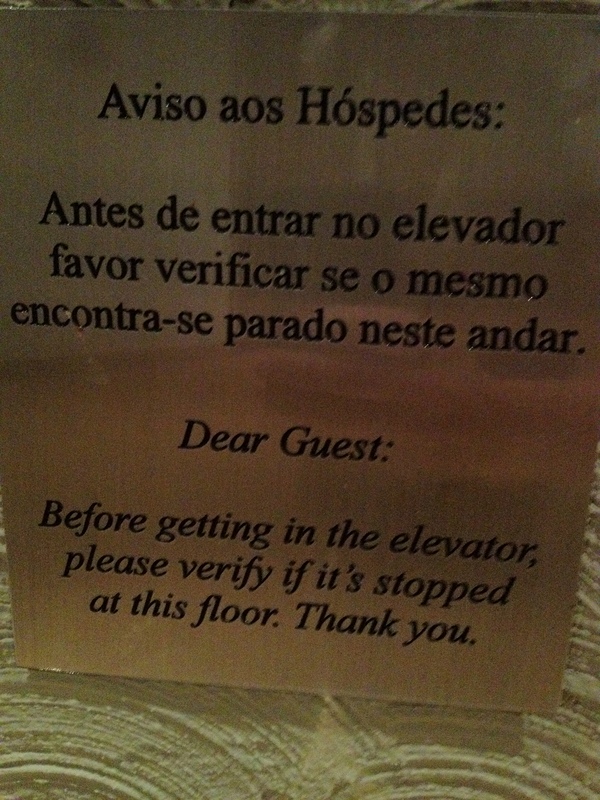 When I first saw this sign during a recent trip to Brazil, I laughed and reached for my camera. Really? I thought. They actually have to tell someone this? I snapped the photo and moved on, forgetting about it until scrolling through my photos this morning. It still makes me chuckle, but my hyperanalytical brain started searching for deeper meaning. All of a sudden, I saw it as a metaphor (surprise, surprise). Have there been times when I jumped into what I thought was a waiting elevator, only to plummet down an empty shaft? Or to alight on top of a car that has almost, but not quite, arrived? My particular elevator isn’t major life decisions, investment strategies, or some other grandiose endeavor. I tend to think about those long and hard, erring toward the conservative side. No, my elevator usually involves my mouth. When I’m on a roll, you might find me jumping into an argument or a discussion having taken a “fact” or two for granted. Given my ponderous nature, I feel particularly humbled when I discover I’ve jumped into an empty elevator shaft without looking and have to climb out rumpled and rueful. Whatever your elevator, check your facts and take nothing for granted. Don’t jump in blind. I guess the sign isn’t so silly after all.